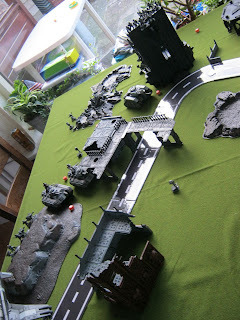 To save time I’d arranged the table beforehand, shifting terrain pieces until we were both satisfied with the setup. The table was diagonally split in half by a road, with some ruins along side of it. One short side had some fortifications and a bunker(building AV14) near it, the other a large dilapidated arbutus precinct (building, AV12). My photography skills turned out to be less than stellar, so unfortunately there’re but a few. We rolled The Scouring, with a diagonal setup. 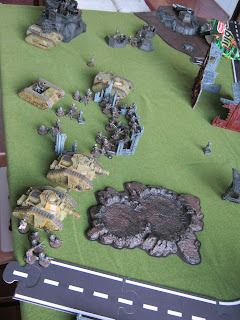 As it turned out I had the 1 and 4 point objectives in my deployment zone, with peter both 3’s and the 2point objectives ending up in no-man’s land. Peter reserved his vendetta, stormtroopers, penal legionaires and sentinel, I left the roughriders and valkyrie with melta veterans in reserve. 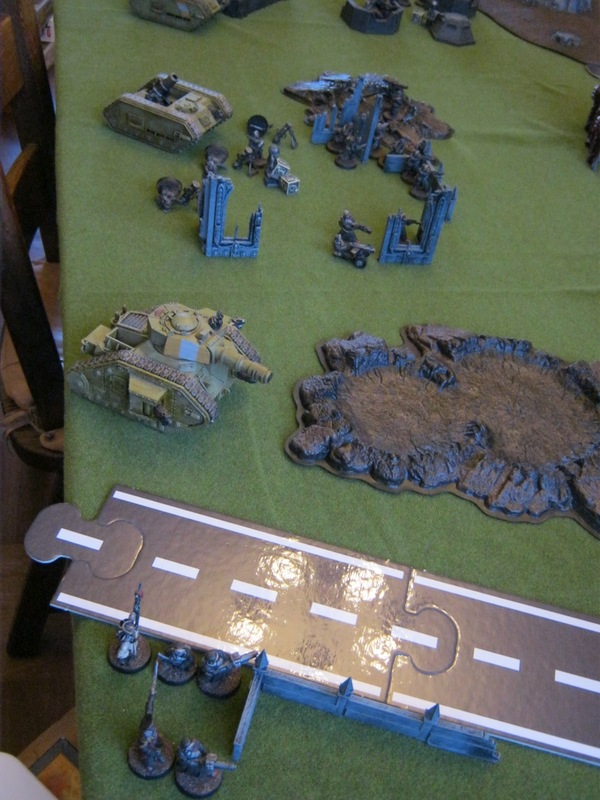 The assault began before first light, with my guns opening up on Peter’s advancing units. Unfortunately for me, even with my searchlights the darkness shielded the advancing Cadians and only a few fell to my torrent of fire. 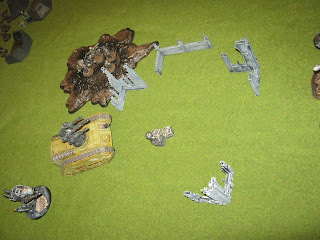 In return a direct hit from both the Manticore and the Demolisher took out a huge chunk of my infantry and destroyed a Leman Rus as well. Not a good start. 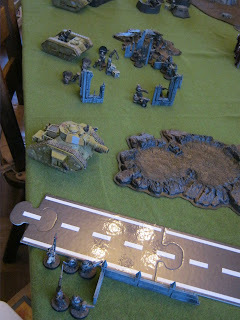 Turns 2, 3 and 4 saw the light of dawn reveal a rather one sided shoot out. Somehow most of my fire either missed, failed to penetrate or was stopped by cover. Peter on the other hand kept pressing on, slowly crippling my units. 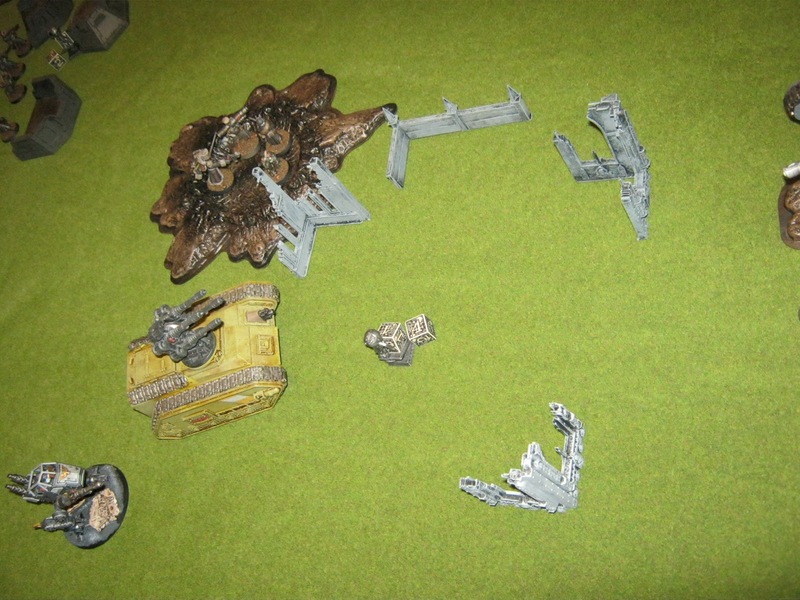 Marbo’s Valhallan Comrade did kill a couple of infantrymen and then absorbed fire from at least four different units before finally going down in a hail of autocannon fire. 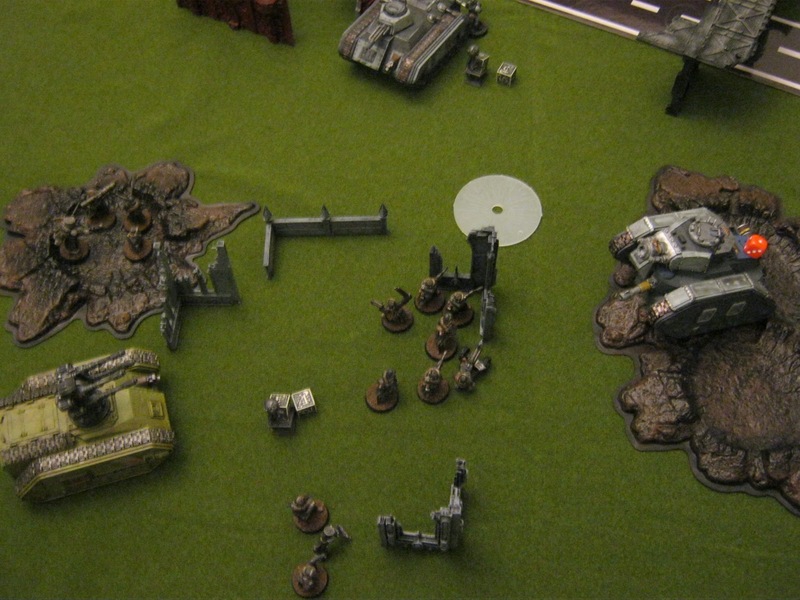 My Psyker, together with the rather late arriving Valkyrie, killed his penal legionaires advancing on one of the unclaimed objectives. Marbo’s Penal Bunkmate killed a number of infantry and was then shot by the CCS. All together though, Peter looked set to get a solid win out of this game. 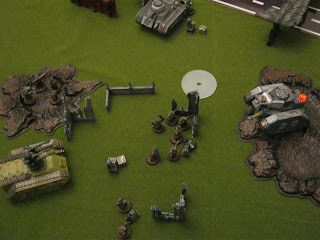 When the smoke cleared (it was the last turn), it turned out to both our surprise that I had won 9-8 in victory points. If we had played one more turn Peter would have won by a landslide, most likely securing the 4 point objective and destroying my objective claiming veterans. That was a fun game! Guard vs guard (or actually most non marine vs non marine) are really fun to play. 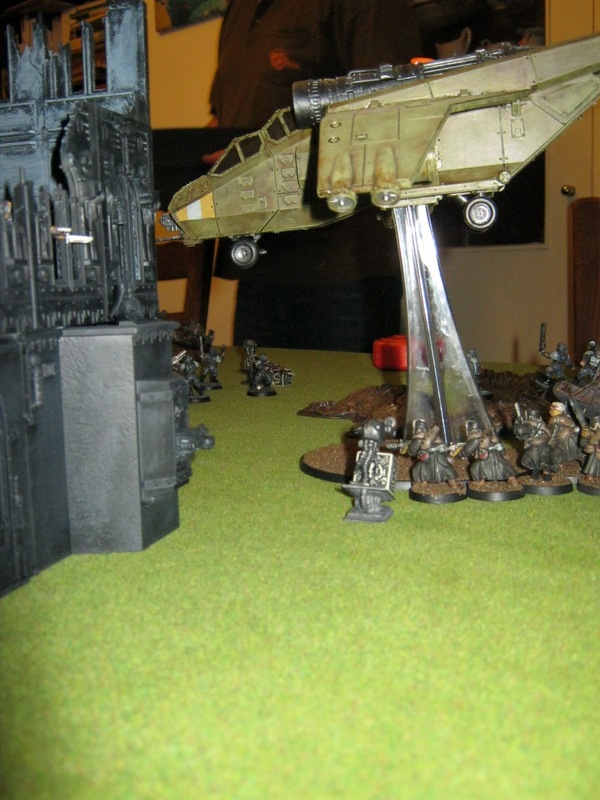 Leadership mattered, infantry had to be careful but still had to take risks to capture objectives, there were lots of different units on the table and fortune swung both ways. We still had to look up a lot of rules but the game already went faster than our previous 6th edition games. Need more troops! At 1500 point four infantry squads and a few command units isn’t enough: guardsmen die fast in this editions and you need them alive to score. I’ll have to do some more scouring on the attic for my other still unpainted valhallans. Templates hurt! On both sides, once the veil of darkness had lifted templates caused some serious damage, both against infantry as well as vehicles. I’ve got to get me one of those Manticores!